Are you as obsessed with busy bags as we are? They’re self contained little activities that kids can do independently during quiet time or on the go. You put them together once and kids can do them again and again which is what makes them so great. 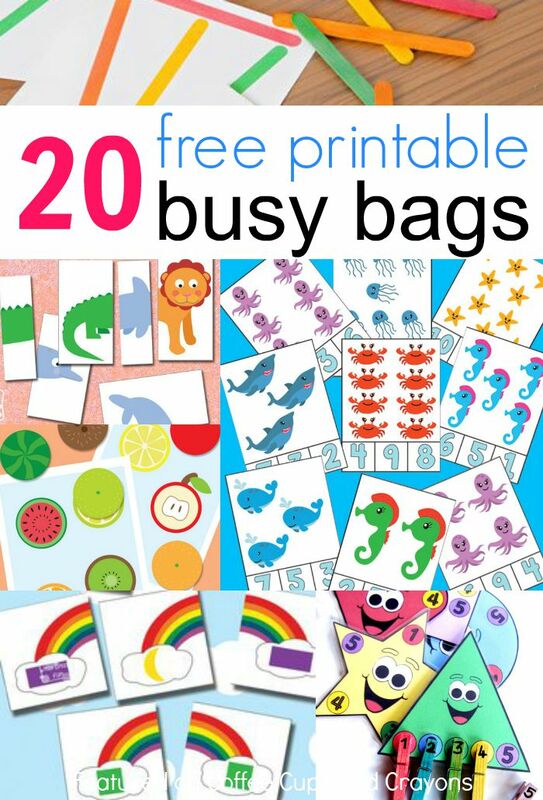 These free printable busy bags are super easy to put together–just print and play! To make printable busy bags last longer you can laminate them either at an office supply store or with a small laminator. Laminators are so much less expensive then you’d imagine and you’ll be surprised at how much you use it. This one (affiliate link) is our favorite! Ocean Count and Clip Card. An adorable and fun ocean themed busy bag to practice both counting and fine motor skills. Silhouette Matching Game. There are three ways to play with this silhouette shape matching busy bag which will keeps kids busy for hours. Number Recognition Busy Bag. Lots of number recognition cards and choices in this busy bag to keep the learning fun. Printable Animal Puzzles. Print and laminate this animal puzzle busy bag that encourages kids to use their imagination. Rainy Day Math Mat. Kids can practice counting and adding with this simple rain themed math mat. School Bus Color Match. A cute printable color match game with a school theme kids will love. Cookie Math Play Dough Mat. There are so many ways for kids to play with this cookie math mat. Laminate it and use it for preschoolers up to grade school kids. 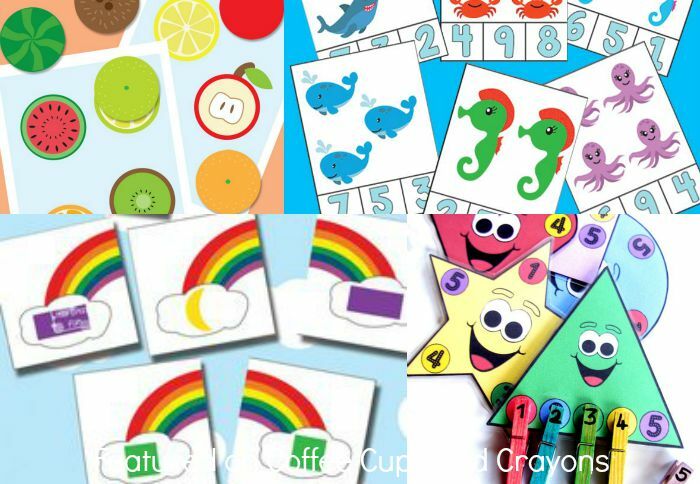 Shape, Counting and Color Busy Bag. Kids will love this cute little shapes busy bag and while they play they can practice colors, shapes, and counting. Mix and Match People and Alien Puzzles. Keep little ones busy creating people and alien combos with these open-ended printable puzzles. Alphabet Road Tracing Book. Put these free letter tracing sheets into a book that kids can drive on to practice writing letters. Color and Pattern Matching Game. Grab some popsicle sticks and get working on color and pattern with your kids with this color and pattern busy bag. Ice Cream File Folder Game. Kids can practice letters and numbers with ice cream learning printables. This one will be a favorite. Rainbow Shape and Color Matching. Pair the matching rainbow halves together in this simple busy bag for preschoolers. Counting to Ten Mats. Kids can explore number properties with these free printable play dough mats. Alphabet Clip Cards. These printable uppercase and lowercase match clip cards are a simple way for kids to actively engage with letters. Watermelon Counting Cards. Count out watermelon seeds onto these watermelon counting cards for both number and fine motor practice. Stargazing Sewing Cards. Develop fine motor skills with these constellation lacing cards. Fruit Slices File Folder Game. Match the correct fruit slice together in this sweet and colorful fruit match game. Smiley Shape Match Clip Cards. These little shapes will definitely make kids smile as they use clothespins to clip the correct shape. Beautiful Bugs Play Dough Mats. Kids can get creative making play dough bugs with these fun play dough mats. With so many fun busy bag choices the only hard part is to decide which one to print and play with first! Keep up with all of our favorite busy bags for kids by following our Busy Bags for the Kiddos! Pinterest board! Follow Megan Sheakoski ::Coffee Cups and Crayons’s board Busy Bags for the Kiddos! on Pinterest. Thanks for sharing these super cute and colourful printables. Hi, thank you so much for sharing these ideas. It helped me a lot who is otherwise zero in creativity and just don’t know how to keep my toddler busy with creative stuffs. Thank you very much. It is very helpful to me..
It’s very useful to teching for kids. Great !! thanks a lot!!! These Busy Bags are amazing! I make them for my grands and they love them. They live locally so I send one or two home with them. Then when they come over they bring them back and get a new one.